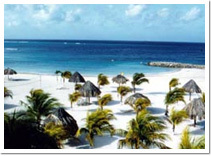 The Aruba Free Zone currently consists of two designated areas in Bushiri and Barcadera. The Bushiri Free Zone covers an area of 9.2 hectare (22.7 acres) and is situated a very short distance from the harbor. The distance between the Bushiri Free Zone and downtown Oranjestad is approximately 1.6 km (1 mile); the distance to the international airport is 4.8 km (3 miles). Covers area of 9.2 hectare (22.7 acres). 7000 square meters (75,000 square feet) of warehouse space. 4.7 hectare (11.6 acres) of open-air storage space. Office and showroom spaces of different sizes. Short distance to airport and Oranjestad harbor. 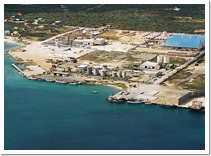 The Barcadera Free Zone lies adjacent to the cargo port at Barcadera, 3.2 km (2 miles) east of the international airport. It covers an area of approximately 45 hectare (111 acres). First phase area covers 45 hectare (111 acres). Industrial park: 11.7 hectare (29 acres) of land available for development. Trade zone: 12.4 hectare (30.6 acres) of land available for development. Services/Showroom park: 20.4 hectare (50.4 acres) of land available for development. Adjacent to airport and Barcadera harbor. Discover how we can help expand your business. Learn how your business could benefit from the Aruba Free Zone.